The awareness of the pauses after inhalation and exhalation is a very simple and efficient method for quieting the mind and opening ourselves to the background of Stillness, of our Real Nature. Nevertheless, the awareness of the pauses is not Spiritual Realization. Being just a technical element, it is transcended naturally when we go deeper in meditation. At a certain level in Hridaya Meditation, focusing on the breath might become a limitation, a barrier that will keep the attention in the technical domain and implicitly towards the personal consciousness. The pauses after inhalation and exhalation do not automatically bring a state of mental void, but they can help us in quieting the mind. This condition of the mind doesn’t necessary imply the revelation of Stillness – of the Spiritual Heart, but it can be revealed easier when the mind is quiet. In the beginning, this method is very efficient for quieting and clearing the mind. But finally, when experience in meditation increases, we understand that Silence is not only in the mind; it is the experience of reality, of sacredness; it is Pure Presence, it is Stillness. Nevertheless, the important element is not the pause in itself, but the awareness of it and the attitude associated with this moment. Pauses always exist in any breathing cycle. 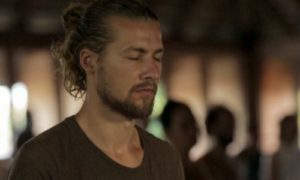 At the end of exhalation before the inhalation starts, and at the end of inhalation, before the exhalation starts, there is a moment of silence. The Yogis consider it as a moment of equanimity, in which the two energies, prana vayu and apana vayu are completely balanced. As a general principle, when there is perfect harmony between two opposing energies, there is an opportunity for transcending the level in which those two energies act. Thus, these two moments have a special quality, compared to all the other moments in the breathing cycle. However, the catalyst of the process is the attitude we have. The pauses are not introduced and seen in a mechanical or strictly technical way. They are moments of total surrender, as if we would dive deep inside ourselves, or as if we were falling sleep, but always keeping our awareness, without the lack of lucidity that characterizes the dream state. The attitude of surrender opens us towards the deep reality of our being, the Spiritual Heart. Therefore, it is more important than the pause itself. It should be kept continuously, even after the pauses, during all phases of the breathing cycle.